Today Selah began the new semester with an energetic tour of Tel Beer Sheva. 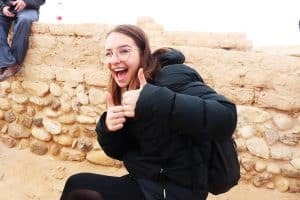 Every month Selah visits and tours an archaeological site connected with a famous Bible story. We call these unique trips a Tanach Tiyul. Today’s tiyul was about the founder of Judaism, Abraham. We learnt about his life and saw the ancient city. The highlight though was getting to see Abraham’s well – thousands of years old. So many Bible stories happen around wells and we drew inspiration from this to do an activity where we all wrote down our own sources of strength and value into a basket.